Here's the wonderful thing about Seneca Red Sandstone: Beyond its rich red color, fine grain and durability, this sandstone also possesses what workers called “quarry sap,” which actually made it easier to cut and carve when it was first mined. For this reason, the Seneca Sandstone Company set up their stonecutting mill in 1837—right at the quarry. Using water from the Canal to power its water wheel and later a turbine, the mill used a toothless blade to cut sandstone at a rate of an inch an hour. The mill also cut granite and stone shipped from neighboring quarries. 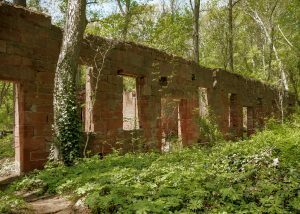 Although the mill opened too late to provide blocks for Canal construction below Harpers Ferry, the red sandstone was in high demand once the mill was in operation. The most visible use of this cut sandstone is the iconic Smithsonian castle on Washington’s Mall. The mill was also used to cut granite and marble used in the U.S. Capitol and the Washington Monument.